My muffin recipe experimentation continues! I am *really* happy with how this flavour turned out! I grated an apple, then decided that cinnamon, coconut and almond would go together nicely. Since I’m watching my sugar intake, I wanted to make these muffins as sugar-free as I could while still having enough sweetness that the flavour wasn’t impacted. Apples have sugar, but quite a bit less than bananas, so I experimented with grating it to add to the recipe as my fruit base. Instead of using maple syrup like I normally would, I substituted medjool dates. Dates are also pretty high in sugar, but they’re less than maple syrup, plus there is some good dietary fibre in there as an added benefit. Also different about this recipe is that I added natural almond butter because I needed to balance the wetness to the recipe since I didn’t use maple syrup. These muffins have much less sugar and oil than any conventional muffins you can buy in the grocery store, not to mention my sugar is natural sugar and I used high quality spelt flour for added nutritional benefit. I can’t even eat the generic muffins anymore – they taste plain to me. 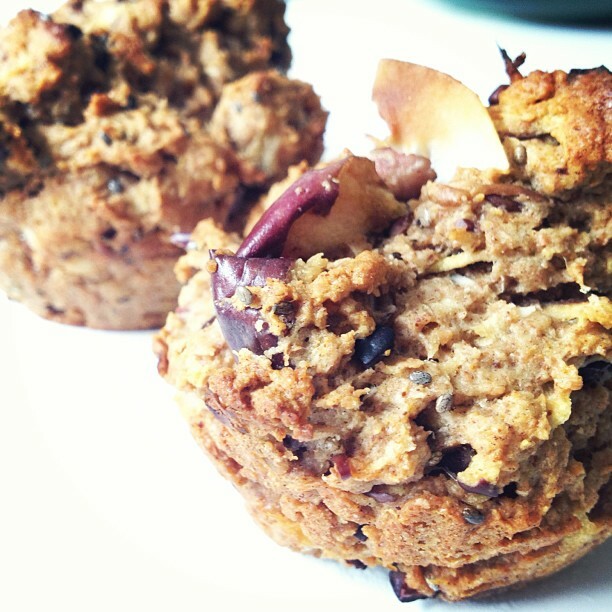 The best thing about my muffins is that they are high in fibre, and a source of iron, calcium, vitamin C and protein! Perfect for breakfast or a mid-morning snack. Try it out and let me know how you enjoyed them! Preheat the oven to 375ºF and grease or line the muffin cups (unless you are using silicone muffin cups like I did; they work best ungreased). This recipe can make 10 small muffins, or 7 larger ones – your call! In a medium-sized bowl, whisk together the flour, cinnamon, baking powder, baking soda, and salt. In a mixing bowl, mix the apple, dates, oil, almond butter, until relatively combined. Stir in the chia seeds and coconut.